Welcome to the 3rd Technique Junkie Newsletter Treasure Hunt. Today we are offering a wonderful prize package designed to give you some of the items needed for the October 2009 issue of the Technique Junkie Newsletter, which is being mailed today! I hope you enjoyed the eye candy from the new issue while you were "on the hunt." A $10.00 Gift Certificate from Sweet 'n Sassy Stamps, so you can buy what you need for the other Techniques! In the meantime, the card on the right is one from the October Newsletter using the Jeweled Acetate Technique. The adorable stamp used here is from Clear Artistic Stamps, and it was colored with Copi Markers, which are available at Croppinsville. See the sidebar of my blog (or on the TJ, Patstamps, or Subscriber-only homepages) to view the discounts from these and other sponsoring vendors. You have followed the hunt... You have a word/phrase. Please note that Beth's letter should have been an O...All you need to do is to leave a comment on this post by 9 am EST Friday, October 2nd and you will be entered to win the prize package and card above. Make sure to leave enough information for me to tell who you are -- be aware that the comments on this hunt will NOT be visible -- I have the comment moderation feature on so that you can leave the word you hunted for privately. Good luck! Congratulations, Tonya Davidson! You are the lucky winner of the giveaway! Pretty in Pink -- PINK CDs! They are here. They are addressed, stamped and sealed. They are in my mini-van...The CDs are here! If you have pre-ordered one, it will hit YOUR mailbox soon. If you haven't ordered one -- don't panic! You can still order. Details are HERE and deals for subscribers are HERE. There will not be a giveaway this week. Sorry! It just so happens that I have a newsletter issue mailing Monday and I am going out of town tomorrow morning for a girl's scrapbooking weekend *(if you happen to be going to SDV, come find me!)*. Did I mention that the Third TJ Treasure Hunt is Monday? Start at the Technique Junkie Design Team blog Monday at 7 am Eastern -- you will love this one lots of goodies for the Treasure Chest.! Finally, to celebrate the mailing of the CDs, I present you with a PINK creation. This uses two techniques: Torn Frames, from June's issue of the Technique Junkie Newsletter; and Vanilla Double from the April 2005 issue of TJN. Still love that technique! All stamps, embossing folders and paper from Stampin' Up! on the above card. See you Monday for the HUNT!!! I just love "Spooky Cute!" The stamps for the giveaway this week from the Stampinbak line from I Brake for Stamps are just that -- plus more! 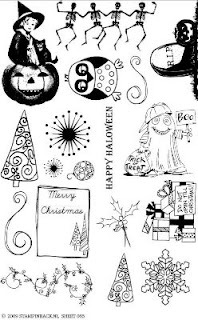 Not only does this rubber stamp sheet have Halloween stamps on it, but it has Christmas stamps, too! Two for one! 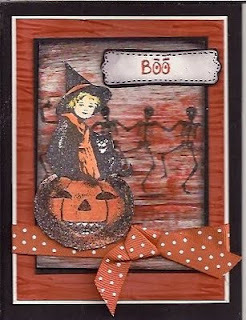 The card I made for today's giveaway uses the Halloween stamps, colored lightly with colored pencils, over a Glued Pastels background (technique from the August 2009 Technique Junkie Newsletter). I stamped the dancing skeletons directly over that...I love the effect. Hey - did you know that Technique Junkie Subscribers receive 10% off their order from IB4S? Just enter the code TJ10 at checkout. Della has just added more of her Humorous Seniors line. Meet Thelma and Louise, Moped Millie, Concussion Conrad, and more! To view all of the new stamps, click here. Also, I Brake for Stamps has just added Spellbinders, Adirondack markers, Fantastix, Memento Ink and more. Some items are limited and will be removed once they sell out. Shipping will be a flat fee of $4.85 for all purchases for U.S. residents. International orders are welcome, but please contact Della for shipping rates. So how do you become the lucky winner of this giveaway? 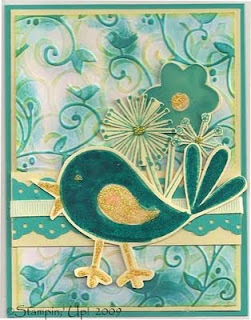 To win this card and the gift certificate, simply leave a comment by Monday, September 21st at 9am est. The winner will be selected on Monday morning. Make sure that you leave enough information so that I can contact you to let you know you won. Just a reminder that Blogger does NOT leave me your email address. A great way to do this is to leave your email address in a spelled-out way, such as "p huntoon at optonline dot net." I will use my handy random number generator to pick the winning entry. You do NOT need to be a TJ subscriber to win. Good Luck! Congratulations to Sheila Turin, the lucky winner of this giveaway! 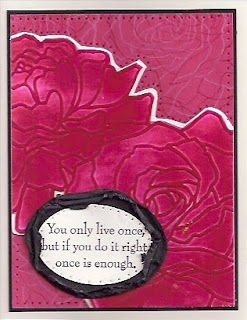 This is a Double-Bugged Card from the June/July 2009 issue of the Technique Junkie Newsletter. 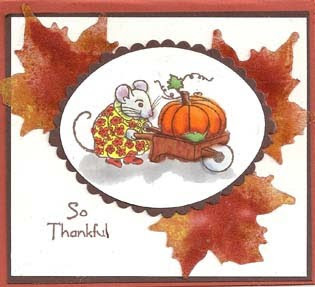 All of the stamps on this card are from the Good Friend set from Stampin' Up!. All of the yellow was "sparkled" with yellow stickles, too. Lots of hand cutting on this one! On another note...CD7 is finished and is at the reproduction manufacturer. Not only is it right on schedule, but it looks fabulous! I finally feel like I can breathe again -- what a huge job to have off my plate. I know it sounds like I am tooting my own horn here...but looking through 101 tutorials this morning, I felt a huge burst of pride. They really are special! Have you ordered your CD yet? 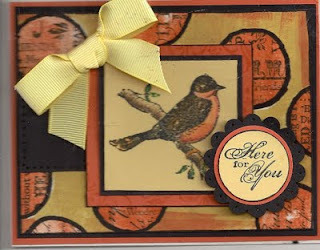 Today's Blogger's Challenge was to post a "Thinking of you" card. Although my card's sentiment is actually "Here for you", it is virtually this same thing! My card uses Stampin' Up! 's Friends 24-7 stamp set on a Faux Denim background from the December 2007 issue of the Technique Junkie Newsletter. It is such a great technique, isn't it? I was thinking today... in the course of the last 7 years, I have "done" over 550 techniques! This year alone we did 101! Yes, 101 -- that is how many techniques are on the soon-to-be-released Technique Junkie Newsletter CD7. You can still pre-order it at the special pricing -- email me directly for details: phuntoon@optonline.net. Oh - make sure to check out the great artwork from the other Blogger's Challenge players, too. The link is on my sidebar (or here). 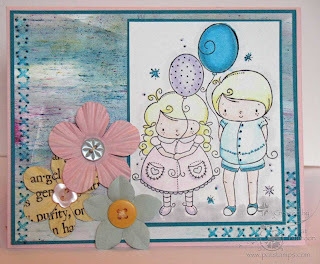 Isn't this stamp set by Rachelle Ann Miller for Stampavie just the cutest? 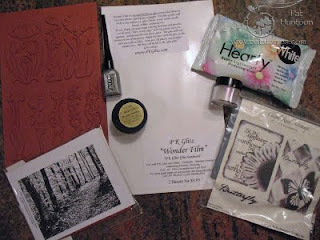 Today's giveaway includes the stamp shown here, and several other goodies shown below. All of this is compliments of Sunflowers and Dragonflies, today's sponsoring company. Does the name sound familiar? That is because it is owned by TJ Team Member Beth Norman! To show off this adorable "Lily and Milo" stamp, I colored them with Copic Markers and layered them over a Glued Pastels Background (August 2009 Technique Junkie Newsletter).The flowers on the side are also part of today's giveaway! 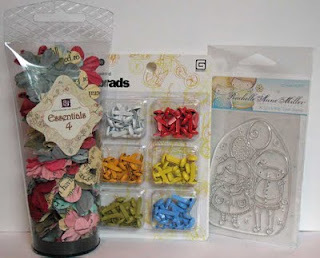 In addition to the card, one lucky winner will receive the package shown above, which includes the stamp, a package of Prima Essentials 4 Flowers, and a 6-pack of painted brads by Basic Grey. It truly is a fun package! Beth is also offering a 15% discount on orders from the Sunflowers and Dragonflies store for Technique Junkies. When you order, leave Beth a note that you are a TJ member; your discount will show up on the billing under the shipping area. So how do you become the lucky winner of this giveaway?To win this card and the gift certificate, simply leave a comment by Monday, September 14th at 9am est. The winner will be selected on Monday morning. Make sure that you leave enough information so that I can contact you to let you know you won. Just a reminder that Blogger does NOT leave me your email address. A great way to do this is to leave your email address in a spelled-out way, such as "p huntoon at optonline dot net." I will use my handy random number generator to pick the winning entry. You do NOT need to be a TJ subscriber to win. Good Luck! Confession time. I made this card in JUNE. Yes, June. I just didn't post it...I meant to. Yes, week after week I thought about this card. It really is pretty in person, and I have been hoarding it for myself! Time to let it go. Comment on this post and I may just send it to YOU! 'kay now. 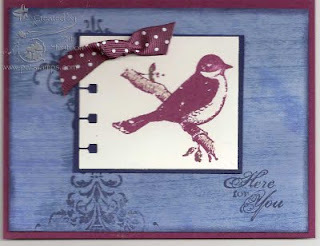 The card uses the Scrappy Spots Technique from the June 2009 issue of the Technique Junkie Newsletter. The Stamps are all Stampin' Up! stamps. Not a great scan...but a pretty card IRL! You know how sometimes you go through periods in your life where things are just way out of control? When you have so much to do that you kind of lose it? I have been in that space recently. Too much to do...too many tasks... brain about to explode. As usual, I feel that if I just keep going, it all gets done...or at least the important things get done. Because of this, I haven't been sharing as much as I should (um, I haven't been making too much, either!). I have a whole plethora of artwork that I have made this summer that I haven't posted yet! The next couple of days I will be posting some of the things I have made...and then maybe, just maybe, I will find time later this week to get my fingers inky (um, I have to find the surface of my stamping desk, too...has anyone seen it?). 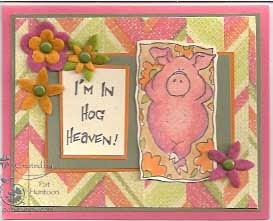 Today's card was made for one of my sisters -- I intended to mail it to her when I went of vacation last -- she loves pigs! Instead, I will hold it for right before SHE goes on vacation. I used the Zig Zag Technique from the August/September 2009 issue of the Technique Junkie Newsletter. The image was colored with Copic Markers. The stamp is from Sparkle 'n Sprinkle.